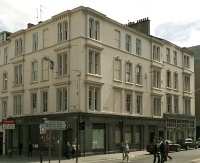 233 Sauchiehall Street occupies the E. corner of the junction with Mains Street, now (2013) known as Blythswood Street. It stands at one end of a larger block, erected c. 1865 and known originally as Kensington Place, which extends E. as far as West Campbell Street. Its yellowish sandstone ashlar facade, now partly painted, has shallow square bay windows to the upper floors. The Willow Tea Rooms at 217 is in the same block, and the completion of Honeyman, Keppie & Mackintosh's work there in October 1903 may have led Henry & Carruthers to employ the same architects to alter their own shop the following year. The whole block was the property of the Henderson Trustees, who are named as clients in the job book (via their solicitors, Macdonald Smith & Co.). As with the Willow Tea Rooms, however, it was the lessees who paid for the work, and who therefore presumably selected the architects. The job-book entry is written entirely in Mackintosh's hand, and one of the drawings approved by the Glasgow Dean of Guild Court is signed by him. However, apart from the Dean of Guild plans, no visual record of the project has come to light and there is insufficient visual evidence to say whether Mackintosh was responsible for the design. The shopfront does not survive, and the drawings show only its general outlines: thin, widely-spaced timber mullions separating large areas of plate glass, and a fascia crowned with a cornice. Today the building has a shopfront of polished grey granite, which appears to date from 20–30 years after the one designed for Henry & Carruthers. 1: The Hunterian, University of Glasgow: Honeyman, Keppie & Mackintosh job book, GLAHA 53062, p. 80. 2: The Hunterian, University of Glasgow: Honeyman, Keppie & Mackintosh job book, GLAHA 53062, p. 80. 3: John R. Hume, Industrial Archaeology of Glasgow, Glasgow and London: Blackie, 1974, pp. 252–3; 1901 Census, www.ancestry.co.uk [accessed 22 March 2013].